The farm-to-table movement has restaurants sourcing food from down the road, ensuring that only the freshest ingredients make it to your plate. Did you know that you can find the same, local flavors in your favorite alcoholic beverages? Taste the wildness of the Cowboy State in your beer, spirits and wine. These Wyoming brewers, distillers and wine makers pride themselves in using local ingredients to create a grain-to-glass experience that captures the essence of the state. This Jackson distillery strives to create quality spirits using only what Wyoming has to offer. 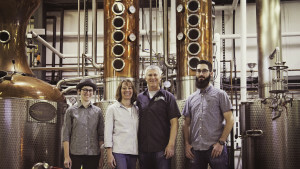 From the water that flows out of Grand Teton and Yellowstone national parks to the Byron, Wyoming corn and Powell, Wyoming oats, this distillery goes above and beyond to keep things local. The entire distilling process, including bottling, is done in-house. And the spent grains? Well, these important ingredients are donated to Haderlie Farms in Thayne, Wyoming, to be used as animal feed after they’ve done their part in the creation of gin and vodka. Jackson Hole Still Works even keeps their label art home-grown by partnering with Jackson Hole’s art association in choosing a new Wyoming artist each year to feature on the labels of their Highwater Vodka and Great Grey Gin. Located in the Big Horn Basin, this family-run distillery is defined by Wyoming. And they make sure their whiskey is, too. Wyoming Whiskey works with local farmer Brent Ragath out of Byron, Wyoming, to source corn, wheat, barley and winter rye – all the ingredients they need to craft quality bourbon whiskeys. Brent's been with the distillery since the beginning, combining his knowledge and passion for growing non-GMO crops to make sure Wyoming Whiskey's spirits are created with the best, and freshest, ingredients around. While locally-grown ingredients play a key role in this distillery's success, the real magic is in the water. Wyoming Whiskey uses limestone water sourced from Hot Springs County. Limestone water is critical to the whiskey-making process, as it filters out sulfur and other harmful minerals so that the spirit's water and mineral content are just right. Every step in this distillery's process – from milling to distilling to aging – is done at Wyoming Whiskey in Kirby, Wyoming. Spent grains (which no longer have sugar but are still a good source of protein) feed cattle in Washakee and other parts of Hot Springs County. This process is enough for Wyoming Whiskey to earn its state-bearing name. And we didn’t even get into the history of the Wyoming-bred family who runs it. This distillery in Pine Bluffs, Wyoming shows what happens when a home-brewer and a farmer put their heads together. The concept for Pine Bluffs Distilling and a local barley and wheat malting facility came from a conversation home-brewer Chad Brown had with his farmer cousin, Gene Purdy. To lower the shipping cost of malt for Wyoming’s growing craft brew and spirit industry, the two decided to start their own malting company, aptly named the Wyoming Malting Company. But the malting facility was only part of the dream. Pine Bluffs Distilling uses fresh, local grains to create their own vodka, Rock Ranch Vodka. The distillery uses an on-site malt house and grains no more than 25 miles from their facility to ensure their product is truly Wyoming grown. Spent grains are repurposed as livestock feed, and vodka is distributed regionally for locals craving that grain-to-glass taste. Nestled in a barn just outside of Bighorn National Forest, Ten Sleep Brewing Co. offers local beers in a true mountain setting. Their Total Blackout Stout beer was crafted for 2017's total solar eclipse and used all Wyoming ingredients, including grains from Wyoming Malting Company. The beer will re-emerge this November as part of their seasonal line-up. Another local favorite, Speed Goat Golden Ale, uses Bryant Honey out of Worland, Wyoming (a whopping 60 pounds per batch), to give the beer its sweet honey finish. As a means of recycling and giving back to the community, Ten Sleep Brewing Co. allows local farmers and ranchers pick up spent grains weekly to feed their cattle and goats. The brewery also offers local ingredients in their tap room, featuring fresh, seasonal appetizers. Summertime snacks include summer sausage from Jackson Hole Buffalo Meat Co., cheese from Zap's Smoke Shack in Powell, Wyoming, and a raw veggie box filled with local produce from Linda Ilg, a farmer and chef who resides in Ten Sleep. This grape-to-glass operation in Torrington, Wyoming was born from the question, “Can you grow grapes in Wyoming’s challenging environment?” The Zimmerer family had been growing crops on their farm for 75 years before the great grape experiment of 2001, which involved Patrick Zimmerer using a portion of his family’s land to test a research project he had designed at the University of Wyoming. The grape-growing experiment was successful, and a small vineyard was established on the family farm. Not wanting their new crop to go to waste, the Zimmerer’s started a winery. 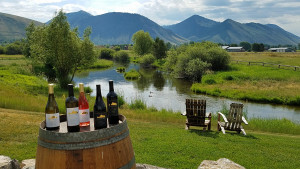 Today this family-owned winery continues to use grapes grown on the Zimmerer farm, along with other Wyoming-grown fruit, to craft their wines. Their approach? Let the fruit do the talking. Lander Brewing Company focuses on supporting Wyoming businesses as much as they can by using and creating uniquely local products. Most of this brewery's grains come from Wyoming Malting Co., only ordering a few needed specialty grains from outside state borders. Mountain-fresh water flows from Roaring Fork River out of the Wind River Range. Since this water doesn't need much treatment between its natural source and your drinking glass, brewers are able to taylor their beer to the water rather than letting varying levels of chlorine, pH and other common water contaminants dictate the brew. 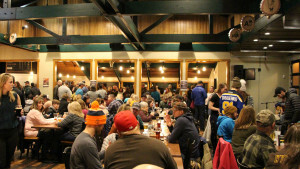 The brewery was originally intended to craft beer for Cowfish Restaurant and Lander Bar, but the beers' success has led to its availability in Casper, Jackson Hole, Riverton and other Wyoming locations. If you want to try Lander Brewing Company's most Wyoming beer, go for their seasonal fresh hop ale. This beer is released every fall using fresh hops grown at Cowfish and 100 percent Wyoming grains. Spent grains from all the brewery's beer is donated to a local, family-run ranch to be used as cattle feed. This distillery with a soft-spot for quirkiness uses almost all Wyoming-grown ingredients in their spirits. Corn is grown just 15 minutes down the road from their distillery near Casper, Wyoming; organic beat sugar is sourced from a sugar company in Worland, Wyoming; and barley comes from a Wyoming malting company. The only ingredient that currently isn’t Wyoming-grown is wheat, which comes from our neighbors to the north, Montana. But Backwards Distilling Company is looking to bring this piece of the distilling puzzle back into Wyoming now that they have their own mill. With Backwards, local ingredients don’t stop at the distillery. The herbs and vegetables used to concoct cocktails in their tasting room are sourced locally with the help of Wyoming Food for Thought. As part of their partnership, Backwards gives this non-profit their organic waste to be used as compost in their greenhouses, bringing this local connection full circle. 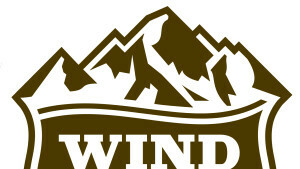 Want more Wyoming craft beverages? 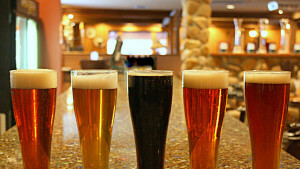 Be sure to visit these distilleries and these breweries on your trip through the state!